In 1787, army-lieutenant and chemist Carl Axel Arrhenius found a rock in a quarry near the Swedish village of Ytterby which he suspected contained the newly discovered element tungsten. Analysis by other chemists did not bear out his suspicions, but ultimately four new elements were identified from the mineral Arrhenius had named "ytterbite" in honor of Ytterby. Carl Gustaf Mosander isolated three new oxides in 1843, one of which he named erbia, hence the element's name of erbium. Erbium 3+ ions have optical properties that account for most uses of the element. Erbium-doped glasses and crystals are used as laser gain media, optical fibers, and amplifiers used in fiber optical communications systems. Erbium lasers also are frequently used in medical, dermatological, and dental, and settings, and stronger erbium-ytterbium lasers are used in metal cutting and welding. The same distinct absorption and emission spectra that make erbium useful for functional optical applications yield the distinct pink coloring of erbium 3+ compounds, and so erbium may also be used aesthetically as a colorant for glasses, ceramics, and cubic zirconia. Aside from its optical properties, erbium is useful for its ability to readily absorb free neutrons, which lends it to use in control rods in nuclear reactors. Additionally, erbium alloys are used for their high specific heat capacity in cryocoolers for use near liquid helium temperatures. Erbium is a rare earth element and can be found in any rare earth-containing mineral, but as a heavy rare earth element (HREE) it is more common in HREE-enriched minerals such as xenotime and euxenite. Additionally, erbium is present in ion adsorption clays, which are a major source of HREEs due to their relative ease of processing, despite the low percentage quantities of rare earths they contain. Erbium has application in glass coloring, as an amplifier in fiber optics, and in lasers for medical and dental use. The ion has a very narrow absorption band that results in the distinct pink coloring of erbium salts. It is therefore used in eyeware and decorative glassware. It can neutralize discoloring impurities such as ferric ions and produce a neutral gray shade. It is used in a variety of glass products for this purpose. It is particularly useful as an amplifier for fiber optic data transfer. Erbium lases at the wavelength required to provide an efficient optical method of amplification, 1.55 microns . Lasers based on Er:YAG are ideally suited for surgical applications because of their ability to deliver energy without thermal build-up in tissue. Erbium is available as metal and compounds with purities from 99% to 99.999% (ACS grade to ultra-high purity). Elemental or metallic forms include pellets, rod, wire and granules for evaporation source material purposes. Erbium oxides are available in powder and dense pellet form for such uses as optical coating and thin film applications. Oxides tend to be insoluble. Erbium fluoride is another insoluble form for uses in which oxygen is undesirable such as metallurgy, chemical and physical vapor deposition and in some optical coatings. Erbium is also available in soluble forms including chlorides, nitrates and acetates. These compounds can be manufactured as solutions at specified stoichiometries. Erbium is a Block F, Group 3, Period 6 element. The number of electrons in each of Erbium's shells is 2, 8, 18, 30, 8, 2 and its electronic configuration is [Xe]4f12 6s2. In its elemental form, CAS 7440-52-0, erbium has a silvery white appearance. 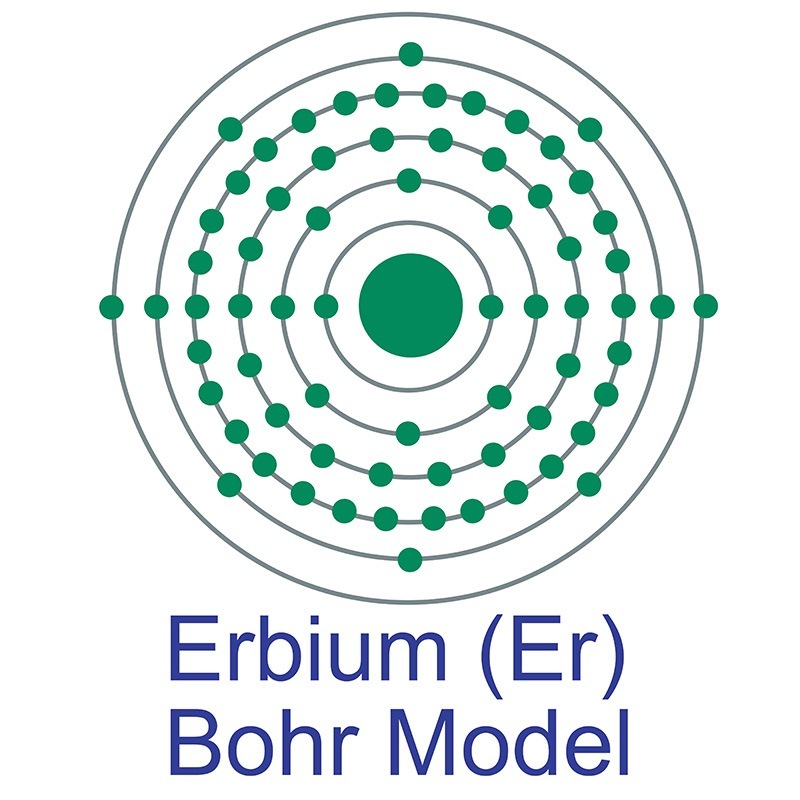 The erbium atom has a radius of 173.4.pm and its Van der Waals radius is unknown. Erbium is named after the Swedish town, Ytterby and was first discovered by Carl Mosander in 1843. Erbium is found in monazite sand ores. Erbium is moderately toxic. Safety data for Erbium and its compounds can vary widely depending on the form. For potential hazard information, toxicity, and road, sea and air transportation limitations, such as DOT Hazard Class, DOT Number, EU Number, NFPA Health rating and RTECS Class, please see the specific material or compound referenced in the Products tab. The below information applies to elemental (metallic) Erbium. Naturally occurring erbium (Er) has 6 stable isotopes: 162Er, 164Er, 166Er, 167Er, 168Er, and 170Er.